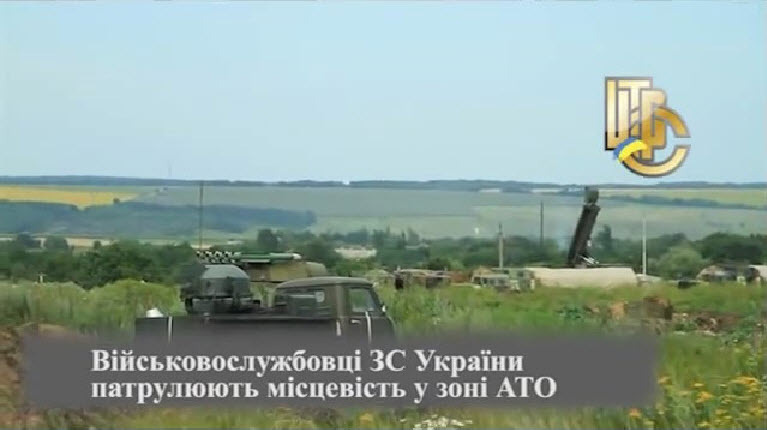 On July 16, 2014, the Ukrainian Ministry of Defense’s television network aired a program about the military situation in Ukraine with the caption “Servicemen of the Ukrainian Armed Forces patrol the area of the ATO zone.” In a segment of this video, two Buk missile launchers, a Buk Snow Drift Radar, and a ST-68U Tin Shield Radar are shown. 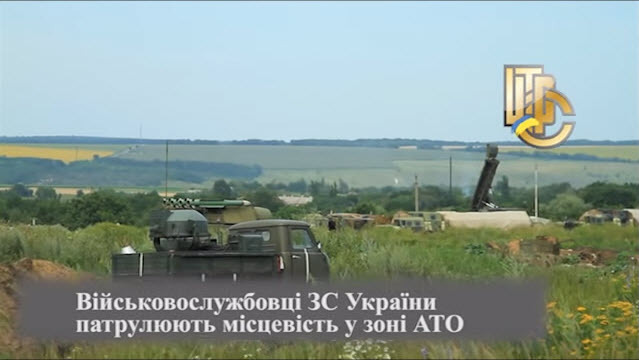 Another video, aired by the same television network and uploaded on 5 July 2014, also shows a military base, including a Buk missile launcher numbered 332 and a Buk missile loader numbered 323. Neither videos specify a location, but a comparison of these videos makes clear that they are at the same base. The uncertainty of the location of the 16 July 2014 video in particular, showing an operational Buk in footage released the day before the downing of MH17, has led to a wide range of accusations and conspiracy theories. Various Russian news outlets, including Kremlin-funded RT and Ministry of Defense-funded TV Zvezda, have given special attention to this television segment and the presence of the Ukrainian Buk system. Dutch journalist Rudy Bouma from ‘Nieuwsuur’ contacted the Ukrainian military about the location of the footage, later tweeting that the Ukrainian military reported that the Buks were stationed in Kramatorsk. They were likely referring to the Kramatorsk airfield, where numerous Buk missile launchers and radar units were deployed throughout the summer of 2014. However, the video was not filmed in Kramatorsk, but instead the Ukrainian “Luna” military base near the village of Dovhenke, located in the Kharkiv Oblast’ to the south of Izyum. The most recent satellite image of the village is from May 2014, making a geolocation of the Buk in the July 16 video difficult. Yandex satellite imagery of the location shows the beginnings of the military camp. However, there are a number of videos of the camp available, including a concert for soldiers and a drive into and through the camp. Some of the landmarks in the July 5 and July 16 videos are visible in satellite imagery, but the more conclusive matches are in these ground-level videos. Further comparisons between the two July videos depicting the Buks and the June videos showing the concerts reveals additional matches in the landscape and structures. 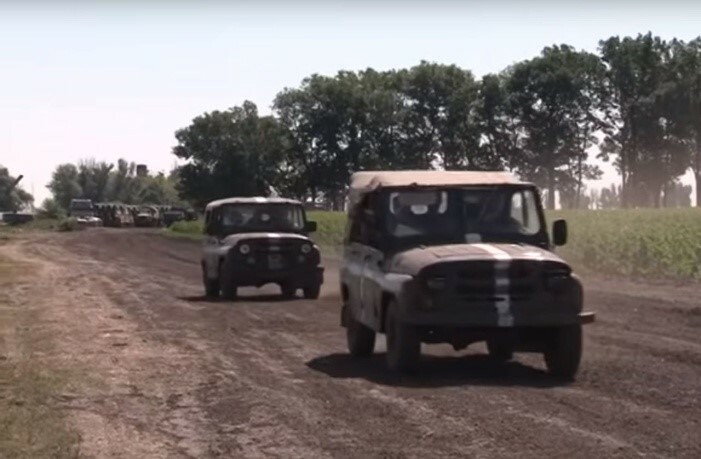 Further investigation shows that military equipment was transported from the Kramatorsk airfield to an ATO base near the village Dovhenke, where the July 5 and 16 videos were filmed. However, shortly after the videos were filmed, much of the equipment—including Buk units—was returned to the Kramatorsk airfield. Not all of the equipment returned to Kramatorsk came from the Dovhenke camp, but some of the Buk units did. Photographs of Kramatorsk airfield of 17 August 2014 show a Buk missile launcher, numbered 312, and a Buk Snow Drift Radar, as previously described in a Bellingcat article. Buk missile launcher 312, as well as all other 3rd Battalion Buk unit vehicles, were transported in March 2014 from a base of the 156th Anti-Aircraft Missile regiment near Luhansk. Several news articles and videos have documented this transport. 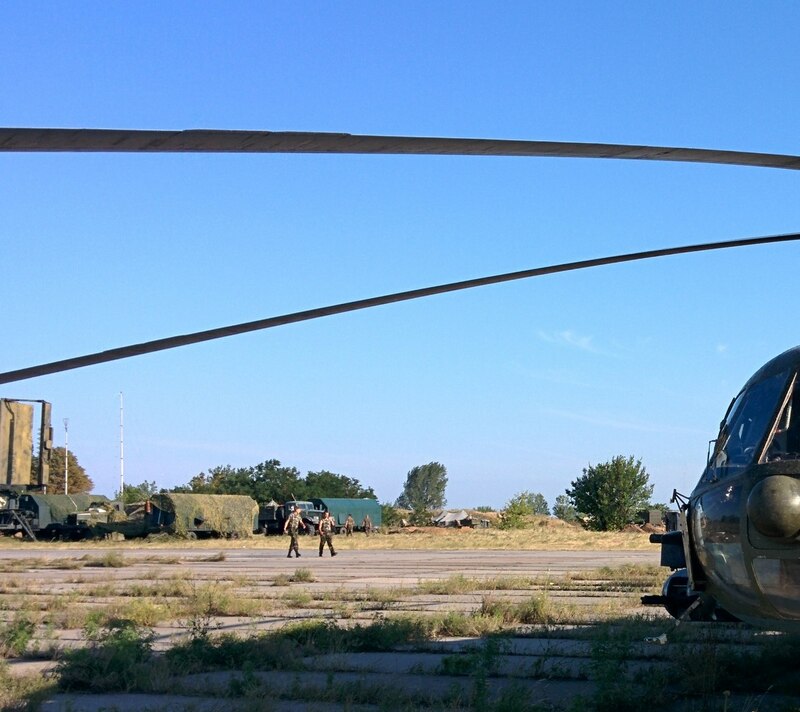 A photograph of Kramatorsk airfield, taken on or before 28 July 2014 per the image description, was uploaded to a blog that shows several images of Ukrainian Buks and other military equipment. That photograph shows the same radar system deployed in the July 16 video; however, the photograph and video were shot in different locations. 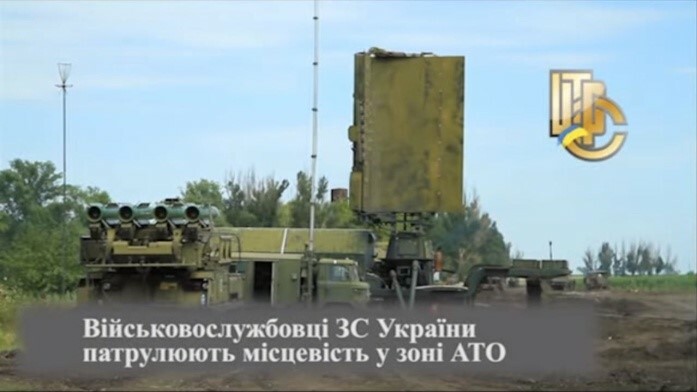 Comparison between the July 16 video and a photograph of the same radar system at Kramatorsk airfield, July 28, 2014. Similar markings on the radar. The colors appear different due to lighting. The footage from both the July 5 and 16, 2014 videos were filmed at the same location: a Ukrainian military camp to the south of Dovhenke, near Izyum, approximately 130 kilometers to the northwest of the MH17 crash site and even further from any feasible launch sites, according to the Dutch Safety Board and Almaz-Antey. Some—if not all—of the Buk missile launchers and radar units in this video footage returned to the Kramatorsk airfield in mid-July. There is no reason to believe that these Buk missile launchers are in any way connected to the downing of MH17. I have a question for know-it-all “Russian Buk” conspiracy theorists. If a Buk missile that downed MH17 was, indeed, launched from an area to the right of the MH17 flight path as the DSB report would have us believe, how come the damage was inflicted on the left side of MH17? Did the missile fly over MH17, make a U-turn and strike the airplane from the other side? Greg, are you playing a role intentionally? Im have same question. As radio engineer im dont know how missile from Zarochenskoe can make so much miss and fly around plane nose instead of targetting centerplane and hit left wing-engine-centerplane area? Yes! You have found each other. The missile doesn’t have to actually collide with the plane. It is detonated in the vicinity and destroys the plane with the shrapnel scalpel. According to Antey, some delay is programmed to affect less defended parts of a combat plane, engine and wings, instead of armored cabin. That explains why it was detonated after it has passed the plane. Some delay cannot move missile thru plane so missile from Zarochenskoe must detonate on right side of plane. Missile 9M38M1 even dont know where plane cabine or nose/wing/engine. This is the same technique that has been used since WW2 or earlier. Anti-Aircraft artillery explodes at a certain altitude regardless if their is a target nearby. Nowadays, missles explode near an aircraft to cause more damage. The warhead is designed that way. This is their design, not a flaw. “Some delay cannot move missile thru plane so missile from Zarochenskoe must detonate on right side of plane” Why? The missile detonates in several milliseconds after the maximum proximity to the target. So that it is expected to affect the middle sections of a combat plane. Normally it is not able to precisely collide with the target, especially in the case of a combat plane or another missile. As Andrew said, DSB launch position to the south of Snezhnoe is also on the right to the plane, so it applies to both versions. Stranger, I am checking out the “Russian Buk” evidence. Take a look at a DSB-supplied image I posted earlier. 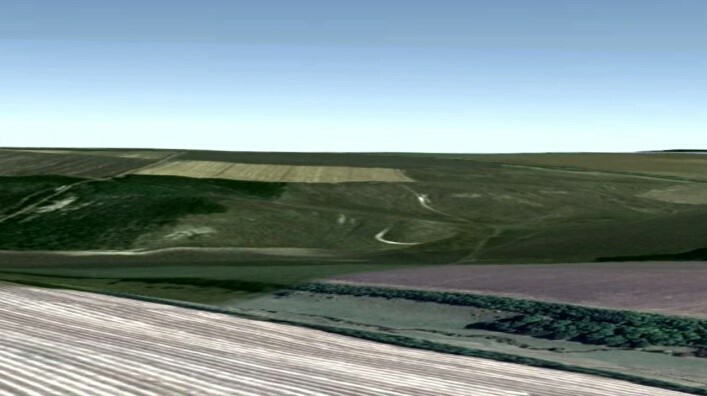 Note that the location of a (reconstructed) point of detonation is to the left of MH17. . How could a missile ascending from the right side of MH17 possibly get to the point of detonation without piercing the airplane? But you know the answer. Probably just trolling for the same team of anonymous and others. A short answer is: the DSB report is a work of fiction. Not so straightforward, but DSB failed to reliably prove their conclusions and didn’t pay enough attention to the arguments of the manufacturer. Both Charvonyi Zhvoten and Zaroshcshenske are biased to the right of MH17, so the question applies equally to any launch area proposed south of Snizhne-Torez-Shakhtersk. Doesn’t even understand how BUK missles work. What a bad troll, at least stranger understands some things. The Russian troll farm is now is filled with idiots. Well, we’ve seen the pictures of the Russian troll-farm building, its address, and descriptions of the work done from former employees. Where is the location of this “other-side-troll factory”..? since you’ve found it…links…? 2011 long before any Olgino/Savushkina 55 had appeared. And BC loves to take social media as the source of the information. So one can expect trolls of all kinds, colors and origins. As for Savushkina, if it really exists I don’t appreciate that, as well as any kind of manipulation, but anyway trolls would exhibit themselves, so nothing to fear. For missile from Zarochenskoe plane give first radar scaterring impulse from right wing and first powerful impulse from right engine. So missile must be directed in point near right engine and centerplane-right wing joint. Why then missile make miss near 25m (more then designed probability miss) and cross plane course before nose then explode? For missile from Snizhne plane give firsr radar scattering impulse from nose section and first powerfull impulse from same point. So missile must be directed in point near right front door. In this cause 9M38M1 missile make only a little miss (like a few meters) and explode as designed, with destruction of plane. Another question is radar fuse work. For missile from Zarochenskoe radar fuse exploding warhead too late. If B777 had some lesser diameter of fuselage then strike elements dont do enough damage to plane. That mean 9M38M1 with same launch point cannot kill plane like military fighter because warhead will explode too late after by-passing nose. It is fake data from Almaz-Antey. Missiles dont explode after target. Radar fuse must initiate exploding when plane parts positioned under certain angle relative to missile. So when missile by-passing nose section warhead already must be detonated. Dynamic field of strike elements have cone shape and turned to ahed of missile course so for penetrate target skin need to explode warhead BEFORE plane. For missile from Snizhne radar fuse make good work. Explode happen when radar fuse found target and give delay enough for damage cabine. Even if radar fuse initiate exploding some before (when first metal part scatter radar fuse signal back to missile) or some after – still plane will be hitted with massive amount of strike elements. In this cause no difference in size of plane for radar fuse – activation inescapable. So you mister liar think missile can turn its side toward to target? Really? Then how about accelleration during this maneur. Come back to school and start learn physic. Missile like 9M38M1 dont do any maneur except following tracking relative position to target. And missile even dont know to where target will fly in next seconds so yes – missile just fly to center of scattering signal + previous movement data like speed and course. Stop, lie! You know nothing about missiles ! I believe this kind of heavy missile calculates a projection for a collision/approaching point based of relative velocities of itself and the target. Otherwise it would have to move by a curved suboptimal trajectory. The moment of detonation is defined so that the missile is preferably oriented by a side to the target. That’s what I believe based on Antey conference report. And please follow at least a minimum etiquette. The Almaz Antey spokesperson actually indicated that there wasn’t a huge difference between the location of the missle relative to the plane in the air but that small differences in the angle of the “scalpel” made big differences to detail of the pattern of damage. The exception was that from Snizhne the proximity fuse delay should have placed the missile further down the fuselage than from the Zaroshchenske (but probably not as much as people visualise in their heads-the Snizhne angle certainly was not straight on or parallel). The damage I can’t reconcile are the roughly perpendicular holes near/just below the pilots position and a weird combination of oblique and some near perpendicular holes the top of the cockpit-fragments can’t turn near 90° in flight and even angkes ricochetting off each other seems unlikely but not altogether impossible. In my opinion all damage analyses on MH17 appears to be novel science and IMO I can see options for a North East missile trajectory IF it was a BUK. The exact logic of the proximity fuse may be helpful, but if the missile electronics were out of calibration, anything goes. What about Budapest 1994, which Russia has violated? What is this your bs excuse about that.? Russia is full of rich liars, I hope they are paying you well. Russia isn’t under attack from anyone from the outside. Putin is attacking his own people on the inside. Russia is going to fall apart, not from attacks from the outside, but Putin attacking the the Great Russian people. Budapest was an agreement on non-proliferation of nuck lear weapon. US pushed post soviet states including Ukraine to move the rest of Soviet nuck lear arsenals to Russia. That was a right thing to do. In the exchange Ukraine was guaranteed independence. But later when US invested 5bil in political processes in Ukraine and supported the Orange Revolution and the Euromaydan revolt, was it the respect of Ukrainian independence? You lie about investment, it was russian 5bil for pull back Ukraine in pro-russian Eurasian Customs Union. Putin think he can rule a whole world and order to other ppl and countries what to do. He born too late, slavery not option in modern time. ‘For the development of democracy’, if fact to tear Ukraine from Russia. As for the Russian loan of 15bil (5bil first trench), Ukraine didn’t return it ‘in the name of revolution’ because it was a ‘bribery to Yanukovich’. It was bribery of Yanukovich and these money is stolen by Yanukovich. Problem of returning money to Russia now is job of justice, not Ukraine. Russia hide Yanukovich so can any time ask him about russian money. USA dont give money to Ukraine before revolution. Russia can blame self for support Yanukovich and organise shooting of protesters in Kiyev, but USA dont involved in it. Enough lie, Mr. stranger liar. You repeat the same Ukrainian lie… The money were stolen, but by those who came after Yanukovych. If you are saying US didn’t invest money in Ukraine to influence it’s politics, then you don’t believe Victoria Nuland. Yanukovych btw was legally elected with most south-east voted for him. Maydan could not have presented a majority, only elections could. And shooters at Maydan – only they actually accomplished the revolution, where they were from? The Right Sector, armed Ukrainian national ists? The investigation is still not over. Why the hell you spread out here lie about Nuland, USA, Ukraine. Fak off too conspiracy theories sites or russian forums. Moderators please ban this troll! I’m just answering your insinuations. As for the Nuland try open the link I posted above. Excuse me, but I cannot help to remark, when you are calling for moderators once you have no other arguments to answer, that is so similar to the whole Ukrainian strategy, to call for US and EU to push Russia by the hands of others, and lie and lie. Wouldn’t trust the russian government and media as wouldn’t trust the ukranian government and media. By what is known by now the russian government lied a lot within this conflict. Some lies were even debunked the very same day. It is just sad to see. While I was away, pro-Ukrainian propagandists made a concerted effort to distract attention from the subject at hand – the location of the Buk missile launch site – by way of mud slinging. It did not work;). Some earlier commentators (i.e. “stranger”) seem to assume, _without evidence_, that the Buk missile trajectory was perpendicular to the MH17 flight path hence, they argue,. the missile’s proximity fuse was triggered by the airplane’s ‘cabin which would explain why, after a few millisecond delay, the missile’s warhead detonated on the opposite side of the cabin. The problem with this explanation is that an ascending surface-to-air missile could not possibly get to the point of detonation, as reconstructed by the DSB, without piercing the fuselage. – the Buk missile was launched from Northwest and not South as the DSB report would have us believe. – the proximity fuse was triggered by the airplane’s wing and not its cabin. Lest we forget, Boeing 777 has a wingspan of about 200ft (60m). – due to a built-in delay, the warhead detonated near the cabin. Greg, c’mon, I cannot admit that you honestly believe in what you are writing. It seems you are playing a role, like a ‘Savushkina 35 troll’, ‘mad Russian’ or whatever to make people to shout: ‘what a nonsense’ and start proving you that DSB report is not that much bad. AnonymousDefender promised to open minds but he doesn’t debate with you, meaning you together are just playing at the same side, the same team, troll factory. Russian and Ukrainian trolls are so much alike one may conclude they’ve come from the same troll factory. Most of the troll’s posts are void of subject matter and filled with personal attack making troll identification even harder. No, no, a slightly bit differently. There seems to be trolls who pretend to be pro-Russian, but in fact are trying to discredit their announced side and wittingly provide false material and welcome others to debunk. So probably those trolls are coming from the other, pro-Ukrainian troll factories. I don’t exclude the mirror situation also. The common sense may help to understand if a person is honest or pretending. Because an honest opinion can be respected. Pretending means disrespect to the readers. Or may be you are just fighting against any trolling as a phenomenon? I agree personalities should not be normally discussed. Thee deputy of the parliament of the Netherlands Pieter Omtzigt (CDA) reported that during the closed hearings concerning the investigation of Malaysian Boeing MH17 crash in Donbass, there was declared that ONLY UKRAINE COULD HAVE SHOT DOWN THE PLANE. I could not agree more. Moreover, I believe that downing of MH17 was a premeditated war crime. You are trying to exaggerate the pro-Russian side to absurd by pretending your are a pro Russian troll? Will see how many would buy it here… Hope real people are not so stupid. Specifically, you believe that your opponent is a troll because that’s who you are:). No, Greg, I believe that because you are writing ridiculous and stupid things, while you don’t look SO stupid. What should I think? May you are just kidding and making fun of people? Are you serious or kidding? But please keep trolling, people don’t forget being made a fool of, will see the reaction. I am sorry but your responses do not make any sense based the information that isvavailable by now. Your communication only seem to be to try to frustrate and putting up a cloud of confusion and try to distract from what is important. Any comment on the recent Dutch intelligence report as relayed to dutch Parliament that on July 17, 2014, the only military body to have possession of a workable BUK was the Ukrainian army? Based on the available information they had, they aren’t omnipresent. I cannot say if the Paris Match picture was forged, as claimed by many forums, but for sure it is the only BC evidence to prove the Buk spotted in Donbass allegedly arrived from Russia, based only on the marks from 3×2 number and the ‘fingerprint’ fender. There were actually 2 Paris Match photos from slightly different angles, so people assumed it were not the best cuts from a video registrator while the original video has never been shown. The word ‘operational’ in ‘only Ukraine had operational buks’ refers to the fact separatists captured an Ukrainian buk at a military base in Donetsk on 29th of June (see p.138) But they claim ‘several reliable sources indicated that buk was not operational’. They didn’t name those ‘reliable’ sources, but probably – Ukraine officials. Please stop your nonsense and stop distracting from what is important. Frank, I gave the original document from Dutches, everybody can read and decide by themselves. Also I believe it was relevant to the question asked in the post above. If you have some original sources to share please do, please be more specific in your critics. You are trying to distract from what is important within this matter. From everything that is known at the moment everything points out to a scenario that was the most obvious from the start. And I believe you are just trying to distract attention from weak points and necessity of proves of the scenario you are trying to impose from the very beginning. Furthermore the shrapnels found within the bodies of the pilots unmistakingly prove which warhead it has been. Ukraine also has this type of war heads. That proves nothing. What is the obvious scenario Frank? Personally I find the idea of a Buk with no radar or support vehicles or spare missiles spirited in from Russia to be preposterous. I have to agree in part. Its not believable a BUK would be supplied with just 4 missiles. It would be useless and defenseless within a couple of days given the operations tempo at Saur Mogila. The missiles are really long and really heavy. They cannot be slid into a panel truck or a tractor trailer dry van, but are normally moved on specialty flatbed trucks that carry six missiles. The fuel logistics could be handled by the BUK moving back and forth to the gas station on the H21. Missile loading could be handled by a civilian crane. Certainly not as convenient as the TEL missile pre-loader vehicle and the custom missile loader crane, but doable in a pinch. Long range radar is a bigger problem. In the single mode w/o a long range radar, the observation sector of the launcher radar is reportedly 6-7 degrees for elevation angle (and 120 for azimuth). That seems unreasonably low. If that is true, then the minimum distance from which the launcher could have seen and targeted the plane flying at 10 km would be about 80 km. That is far more than about 25 km between the shoot down point and the proposed launch site to the south of Snezhnoe as well as Zaroschenskoe, and far more than the fire range of the launcher. From 25 km the elevation should have been about 21 degree, the launcher could have stay uphill may be, but we were told it was an open field. Does it mean the launcher on its own, w/o TELAR could not have seen the Boeing? As usually, Mister Strange Liar again lie. Observation mode of 9S35M1 radar (TELAR) have 2 scan modes – Down and Up. Radar in Mode Down can scan elevation area 0-6 degree, in Mode Up can scan elevation area 6-12 degree. Could you share your sources, mr Cad? But I have already found a similar info, that 6-7 degrees is the operational window, while the radar itself can be quasi statically tilted in a much wider angles to horizon. That sounds reasonable already. More or less the same as you are saying, I just don’t understand where did you get 2 up/down modes? The max of 12 degrees as you said would still not be enough. So a standalone launcher could have potentially operated w/o TELAR. Oups, sorry I used an incorrect term, TELAR is the launcher, I meant a target acquisition radar (TAR) vehicle instead. TEL can load missiles on TELAR with own crane. Interesting but Ukraine somehow didnt sent TELAR with TEL deep into enemy territory (and decrease number of firing missiles from 8 to 4 and total ammo from 12 to 4). May be because Ukraine dont attack MH17 but russian terrorists which used one TELAR towed by Volvo truck. 4 missiles would be 2 shots for a Buk. They always fire 2 missiles on a target in Russian air defence doctrine. Two missiles used when target is hard for intercept (probability to kill is lesser then 0.9) then two missiles give high probability to kill. Also 9M38M1 missile have 2 modes for lock target. First missile from TELAR can lock target in air (when missile already fly to meeting point), this mode is great for low-alt, low speed targets or using ECM. Second missile (from TELAR or TEL) using lock on launcher mode when missile radar seeker lock target frequency answer. This mode is great for reducing firing channels of command guide since missile dont need any correction after launch. Also this mode give different trajectory of interception so maneuring targets dont avoid intercept from both missiles. But TELAR crew must fire only one missile when targetting INBOUND target. This target is very easy for intercept (probability to kill ~0.9). As we know MH17 was killed by one missile so this target was INBOUND for TELAR crew so TELAR positioned on direction to Snizhne, not Zarochenskoe. A conjuring trick, a sleight of hands? How is Snezhnoe/Zarochenskoe related to ‘inbound’ or one/two missiles? Theoretically could a missile be targeted and launched to a combat plane, but in the air recapture the larger but father target like Boeing? That seems particularly far fetched. When the target is selected and locked, the altitude and speed of the captured target that the BUK is painting with radar is clearly indicated. Well, Ukrainian army (which, actually, must be one of the suspects, no way to be an investigator) is definetely reliable and honest source of information. Haven’t read anything what makes me laugh more. And, by the way, one can easilly spot several dismathces on the photo pair (i mean which one with soldiers and another with the Buks, allegedly made at the same place). that’s the trouble with bellingcat’s geolocation, it can never be proved one way or another and it’s based on things like trees or lamp posts looking somewhat the same. Could you share your sources, mr Cad? But I have already found a similar info, that 6-7 degrees is the operational window, while the radar itself can be quasi statically tilted in a much wider angles to horizon. That sounds reasonable already. More or less the same as you are saying, I just don’t understand where did you get 2 up/down modes? The max of 12 degrees as you said would still not be enough. 0-6 degree and 6-12 degree is enough for searching target by TELAR and detect targets on range up to 100km (for Down mode alt=0-10500m, for Up mode alt=10500-20800m). During searching TELAR crew must switch mode from Down to Up. If crew was noticed about inbound hig-alt target (by forward visual observers or by spy info) then crew should search target mostly in Up mode where MH17 can be detected on any operational range. Radar 9S35M1 work not only in search mode (when automatically scanning zone 0-6 and 6-12 degree) but also can change elevation angle from -5 (negative elevation for cancel landscape profile) to 85 degree. By far this is the most interesting post you have made on any of the internet forums on this topic. I hope everyone can appreciate that also. The only addition I would ask you to make to it is to confirm the maximum radar range capability of the TELAR in autonomous detection mode. I know you have provided the figure 60-70 km in the past with reference to display boards at a Russian Arms show. In the 0-6 degree scan mode, a BUK at Snizhne will not see a plane flying at the altitude of MH17 closer than 95 km out. This is a matter of simple trigonometry. 95 km from Snizhne is Konstyantynivka. At MH17’s speed of 15 km/minute, that would place the nearest time of detection at approximately 16:15:20. As the missile was not fired until around 16:19:30 seconds if fired from south of Snizhne, this means the crew would have locked on and tracked the plane for over four minutes before making the fateful decision and would have had to consciously either switch modes or lock on a very high altitude target. I think it goes without saying that as a default mode of air defense against ground attack and bomber aircraft operating at standard military flight levels, a 0-6 degree scan mode, what you call the DOWN mode, makes the most sense. So then what if the TELAR was in UP mode? In UP mode from Snizhne, objects below 7 km would be invisible if they were further out than 66 km. This distance is just east of Horlivka (Horlivka is 70 km). Objects above 4 km (out of range of MANPADS and Strela-10) would be invisible further out than 38 km, which is near Maloorlivka and Kirovske. MH17 would of course be immediately visible. Interestingly, so would SQ351 – the Singapore Air flight just behind and to the right of MH17 between Horlivka and Artemivsk. If the TELAR was centered in its 120 degree sweep near Horlivka, it would scan the sky from just south of Donetsk to just west of Alchevsk. This would mean it was not looking into the Ukrainian controlled territory in ATO Sector D towards Mariupol or Sector A north of Lugansk, both of which were known flight paths of flights to/from the Saur Mogila/Snizhne area. For example, had the TELAR been pointed towards Dokuchajevsk as the center of its 120 degree scan, it would have covered from the Russian border to just south of the flight path of MH17 without ever finding MH17. If it was turned north and centered on Alchevsk, it would have covered from the border at Krasnodon to just shy of MH17, and would have only found SQ351 as an aerial target but missed MH17. The direction of Horlivka would put any Ukrainian military flights on the longest possible path across dangerous DNR/LNR held territory known to be bristling with anti-air weaponry, while the shortest path would be an approach from the southwest which would be entirely over Ukrainian military controlled territory until perhaps 10 km out at most. The implication of the direction of Horlivka is a flight on a direct path from Myrhorod Air Base or less directly Chuhuiv. A direct path of a flight from Dnipropetrovsk is 25 degrees west coming directly over Donetsk. Myrhorod is a base for fighter aircraft and fighter-bombers, not high altitude transports. Ukraine’s high altitude transports can be found at airbases at Melitopol and Boryspil and to a lesser extent at Chuhuiv. When was the TELAR switched on? If we assume a unit fire-up time of around 5 seconds and a standard 25-30 seconds to locate, lock-on, and authorize firing, it must have been at least slightly before 16:19:00. At 16:19:00 MH17 was around 40 km out at 308 degrees from the Snizhne BUK and SQ351 at 65 km out and around 9 degrees clockwise from MH17 at 317 degrees from the Snizhne BUK (0 degrees being counter as due north, and degrees increasing in the clockwise direction). At 16:18:00 the relative positions were 55 km out and 305 degrees for MH17, and 80 km out and 314 degrees for SQ351. Only being switched on in UP mode allows for these relatively late scan times. If it was on in DOWN mode it had to be emitting radar for many minutes to have found MH17, making it an open target to Ukrainian attack planes hunting for its signal. This leads to the following questions regarding a rebel TELAR at Snizhne. 1) Why was the Snizhne TELAR switched on and targeted in UP mode when it would be much more likely to find military targets in DOWN mode? 2) Why was MH17 selected as the target and not SQ351 when both would have been clearly visible on the radar? 3) Why were both planes not targeted in sequence? What would generate the conclusion one was a threat or target and the other was not? 4) What made the TELAR be targeted toward the direction of Horlivka instead of further north (the flight path of the AN-26 of July 14) or further southwest (the flight path of most inbound and outbound attack flights on Saur Mogila and Snizhne). 5) How would a BUK operator mistake a plane at 10 km and 900 km/h for a plane with a ceiling of 7 km and 450 km/h when there is a direct readout of speed and altitude for selected targets? Very legutimate and logical questions Andrew, hence you will get no meaningful answers. BTW, the BUKs parked at Zaroshchenske had ray domes facing South. Dude, you just a stupid troll. Could you explain for the most stupid, how did you get to the conclusion it was from Snezhnoe and not Zaroschenskoe after 2 paragraphs of irrelevant specific technical details? May be it would be easier to understand if you gave your sources, like a link or something please? Irrelevant specific technical detail is how Buk missile fly. Only your crazy mind can call it irrelevant. I meant irrelevant to the conclusion. Ballistic cannot be irrelevant. Your mind dont want to see facts but believe in weird mixture of pro-putin politic and cynicism. You found wrong platform for raise your skill in it. Smolensk forum waiting for your lie hard. I’m completely lost in the variety of trolls here, whose side is who. Why do you discredit Ukrainians as people now by your demonstrative bad manners?